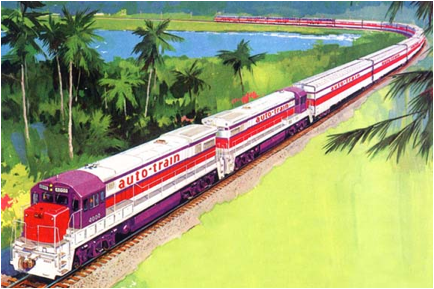 The auto-train corporation, founded by Eugene Garfield, implemented a government study that said a train travelling from the Washington DC area to the Disney World area in Florida, with vacationers and their cars, would be profitable. The commercial railroads were not interested because they were selling all their passenger equipment to Amtrak. But investors funded the bargain purchase of cars that railroads were glad to get rid of, the Seaboard railroad agreed to let the new auto-train run on its tracks, hence a unique and colorful new train was born. The first train ran in December 1971 between terminals in Lorton Virginia and Sanford Florida. It was an overnight run, and became very popular. The 75’ 2-level auto carriers were purchased from Canadian National. 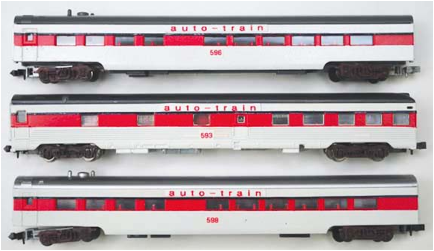 In 1976, new 3-level 89’ auto carriers were delivered that were similar in size to the cars currently run by the railroads for transporting autos. Unfortunately, derailments and equipment damage in 1976 and 1978 and the unprofitable Louisville Kentucky to Florida train damaged the company’s finances, and in 1981, auto-train went bankrupt and ceased operation. 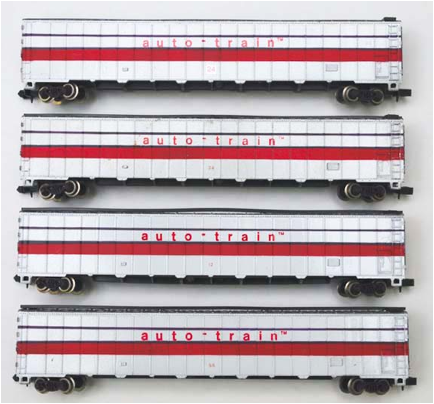 Amtrak purchased some of auto-train’s rolling stock, and started a very similar Auto Train service in 1983. Train power was two General Electric U36B locomotives. About 20 two-level auto carriers followed the locomotives, but in later years the auto carriers were placed at the rear of the train instead of at the front. All coaches were dome cars, and sleepers were available for first class passengers. Buffet cars, a night club car, and cars showing movies kept passengers entertained. One or two heater cars provided steam heat, and a caboose painted in auto-train colors brought up the rear of the train after the auto carriers were moved to the rear. That way the passenger cars always had heat available, and the last car was always occupied for safety reasons. This a long train to model. A full train is impossible for O or HO scalers except on large club layouts, but is manageable for N scalers on room-sized layouts and is impressive on Ntrak modules. The auto-train in March 1972 (photo by Marty Bernard). Note the number and location of the full-length dome cars (tall cars near the rear) varies from the 1974 train modeled here. The auto-train at Gum Tree Virginia. Photo by Marty Bernard. This illustration is from a GE advertisement for the locomotives issued before the train was actually run. Visible are the distinctive auto carriers and full domes, but omitted are all of the short dome, sleepers and other cars. This painting probably influenced Bachmann to issue just the locomotives and the two car types in the 1970s. The middle of the train looking forward as seen from a dome coach. The train is a long one, carrying 13-20 auto carriers and running about ½ to ¾ miles long. In peak periods, the train ran in two sections separating autos from passengers. The paint scheme of white with red and purple stripes is unique for railroads. Car roofs were left as the color of the original car, aluminum, grey or black. In the 1970s, Bachmann issued the locomotive, full dome coach, and auto carrier. The train can be modeled in N scale from the original Bachmann cars and by repainting the other domes, diners and sleepers. Many of the non-Bachmann cars have been released but decorated for their original road names. Dome coaches were of three general types: full-length domes built by Budd and bought from the Santa Fe, “maxi-domes” built by Pullman standard or ACF and bought from Union Pacific, or “mini-domes” built by Budd, used on the California Zephyr and bought from Western Pacific. I’ve located two sources of information that are very useful for researching and modeling the train. The site http://www.themetrains.com/auto-train-main.htm has a good history and many color photos of the train and its rolling stock. A pair of articles by Jim Hediger (“auto-train: a railroad service you can model”, Model Railroader, December 1974, focuses on modeling cars in the train; “auto-train, this highway is not on your oil company map”, Trains, December 1974, focuses on history, equipment lists and consists) are essential for serious modelers of the train. The consist of the train #3 I modeled is from Hediger’s Trains magazine article, which left Lorton on April 4, 1974. The train had 21 auto carriers but my fleet only has 17 at present. Photographs on the website above show consists where the order of the dome cars varied from the train that Jim Hediger rode on 1974. I used the factory made locomotive shells and the Bachmann auto carriers and full dome cars. I replaced the 1970’s locomotive mechanisms with quiet running and powerful Bachmann U36B mechanisms made in the 2000’s. I painted the other cars, using prototypical cars when I could get them and other similar or stand-in cars I had available. The train as pictured is from the early years when the auto carriers were behind the locomotives, and a heater car was at the end of the train because the auto carriers did not have steam lines for heat. In later years, the auto carriers were at the end followed by a caboose. Locomotives were 2 or 3 U36Bs bought new from GE. They were released by Bachmann in the 1970s and are accurate as made and as painted. The locomotive trucks and all passenger car trucks were painted purple. The early Bachmann mechanism is very unreliable and is very noisy. I replaced the entire mechanism with a later Bachmann release of the same U36B, but kept the original shell. The locomotives are heavy and are good pullers, which is needed because early Bachmann cars have more rolling friction than is now common in N scale. Following the locomotives were 13-22 two-level auto carriers. The 75’ cars were purchased from Canadian National. Ramps at the terminals loaded cars through the end doors. 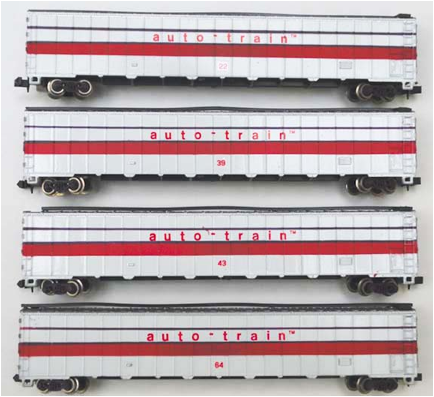 Most of these carriers were later sold to Amtrak for use in their auto train when the auto-train corporation went bankrupt in 1981. These are original Bachmann models, which I slightly modified by adding red car numbers. I have 17 carriers. The auto-train corporation used only dome cars as coaches, and bought these full-length domes from Santa Fe after they got out of the passenger business. Two are coach-dorms and one is a standard coach. 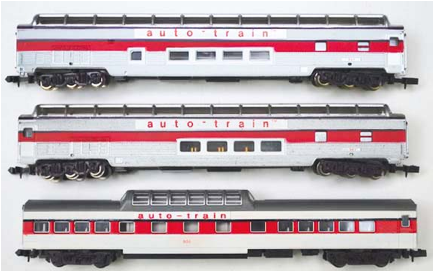 These are factory painted Bachmann models and are prototypical for the auto-train, right down to the wide letter-board. The center car is a semi-corrugated kitchen dormitory formerly owned by the Seaboard, Atlantic Coast Line and Chesapeake and Ohio railroads. I don’t have a model of this car but used a Rowa observation-lounge to get the semi-corrugated effect. The other two cars are buffets (dining) cars that showed movies after dinner, formerly Norfolk and Western coaches. I used Con cor dining cars to simulate the buffet cars. Next are a full-dome night-club car and a standard full-dome coach. These are factory painted Bachmann models. The next two coaches are “maxi-domes”, formerly with the UP and used on City trains. 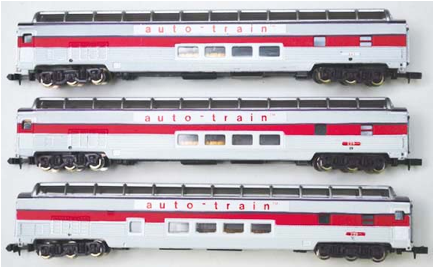 These are repainted Kato models and are prototypical for the auto-train. At top is the second “maxi-dome” coach, next is a “mini-dome” coach built by Budd and owned by the WP. 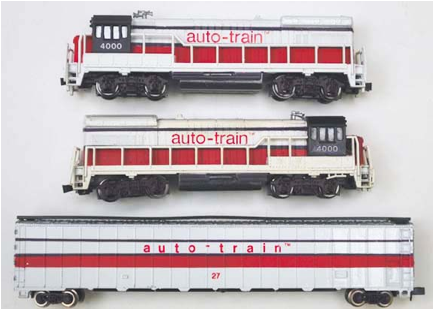 The middle car above is a custom painted but prototypical auto-train model made by Con cor. The second “mini-dome” coach was also built by Budd, but as far as I know was not of the exact type used on the auto-train. Most of the sleepers bought by auto-train were 4-4-2s, 5-2-2s or 6-6-4s, but many sleepers were modified by changing partitions to make them suitable for families. They were at the end of the train. This train had four sleepers. 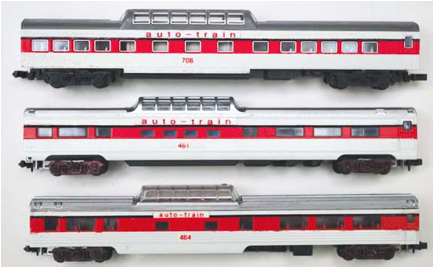 The fourth model car above was originally a 4-4-2 in the Regal series bought from the Santa Fe, and is prototypical for the auto-train. It is a custom painted Kato model. The other sleeper models are all Rivarossi 10-6 cars. Though not exactly prototypical, they have a similar appearance. The heater car provided steam heat to passenger cars and had to be behind the auto carriers because the auto carriers did not have steam pipes. When the auto carriers were behind the locomotives, the heaters were at the end of the train. 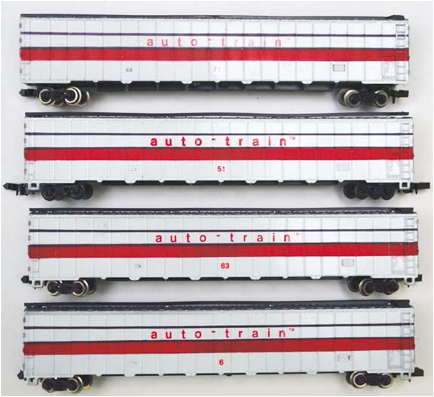 The auto-train had several types of heater cars, one of which were former UP baggage cars like this Kato model. The cabooses were only used in later years when the auto carriers were at the end of the train and it was necessary to monitor brake line pressure and be able to observe the whole train for any trouble. They were “extended vision” cabooses similar to those on the host Seaboard Coast Line railroad. This Bachmann model is reasonably close to the prototype. The GE U36B locomotives, the auto carriers, and the full dome cars were issued by Bachmann in the 1970s and are still available on the used market. I replaced the old, noisy locomotive mechanism with a newer Bachmann mechanism made for ATSF and BN model versions of the same locomotive. I use the original rapido couplers and trucks of the passenger cars because they work well (even though they do not look prototypical), because I don’t have to install new couplers, and because the cars never couple with any other cars using knuckle couplers. I used available plastic cars for the other cars not made by Bachmann. If I did not have the exact car type or did not want to sacrifice an existing car, I used a close substitute from my extra cars. 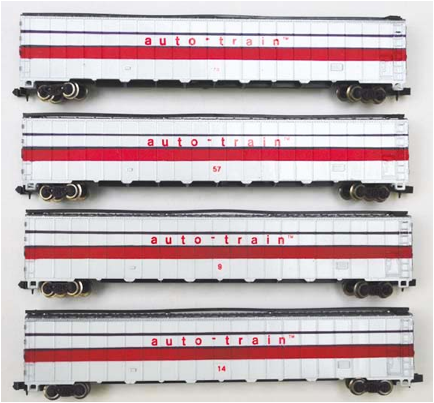 Jim Hediger’s Trains article lists the type and original railroad of every auto-train car, the themetrains website has auto-train photographs of most car types. Serious modelers should be able to track down prototype cars or sides for most of the cars. No auto-train decals are available, and I could not find lower-case letters in any color. The easiest solution was to make labels with a Brother printing labeller, which has two different fonts and 6 different letter heights. 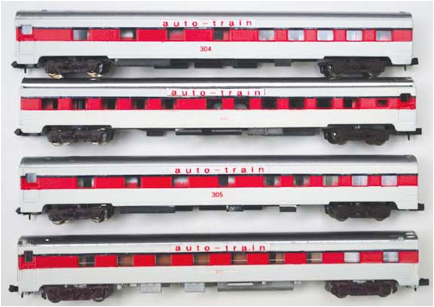 One type of label tape is red lettering on white, perfect for the auto-train. In most cases I applied the auto-train label to a thin strip of styrene, which was easier to cut and position in the letterboard than the bare label. I added car numbers with red letters on a white background either from decals or from labels made with the Brother labeller. No domestic supplier makes the purple stripes needed for the cars, but some European-made stripes are available sold under the name Colorado decals on ebay. They are a little darker shade of purple than the auto-train used. Ely, Wally, Images of rail: Auto-train, Arcadia Publishing, 2009, 128 pages. Hediger, Jim, auto-train: a railroad service you can model, Model Railroader, December 1974. Hediger, Jim, auto-train, this highway is not on your oil company map, Trains, December 1974.